Overhead cranes are designed and built to meet our customer’s specific capacity, span and lifting height requirements. More importantly, Reading Crane and Engineering Co. takes careful consideration with regards to the intended use of the crane. Whether the crane is top-running or under-running, single girder or double girder, CMAA Class C, D or E we have the ability to select the proper components that make up an overhead crane from our numerous suppliers of crane components. As Master Dealers for R&M Materials Handling, Yale-Lift Tech, Harrington, Demag, Gorbel, Stahl and many others, we select hoists, trolleys, endtrucks, controls and electrification that best fit our customer’s application and budget. Our complete cranes are fully assembled, painted, wired and tested in our Reading, PA facility. Each crane carries the “READING” name which has meant quality, timely and competitive products for over a century. When you have a tight clearance or a tight specification, consider a crane built and serviced by Reading Crane and Engineering Co. The most important part of any overhead materials handling application is selecting the correct hoist to do the job. Your productivity and safety depend on it. Whether wire rope or chain, manual or electric or air powered, single girder or double girder trolleys, low headroom or standard headroom, we are able to assist in selecting the best hoist for your needs. Our long relationships with such companies as R&M, Yale-Lift Tech, Harrington, Demag ACE, Stahl, CM, Coffing, JD Neuhaus, Electrolift, Chester, Detroit, Ingersoll-Rand, Saturn, Gorbel, Shepard Niles and others allows us to select from literally thousands of models, designs and options. Our purchasing volume has positioned us to be very cost competitive. 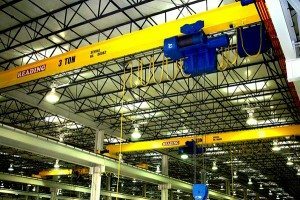 Many of today’s pre-engineered buildings or older structures simply cannot support the loadings imposed by overhead traveling cranes. This does not mean there aren’t alternative options for these types of facilities. At Reading Crane, we engineer, design, fabricate and install free-standing runway systems. These systems are engineered to limit the stresses on your building and are designed to meet all applicable codes and regulations. Totally free-standing outdoor runway systems are also available. Look to the Reading Crane team of Structural Engineers, Fabricators and Installers to give you a turn-key system including properly sized crane rail and runway electrification. Many times an overhead crane does not end at the lower block and the application requires a below hook attachment designed for your needs. From spreader beams to coil lifters to Chooks to tong grabs to sheet lifters, we can offer the proper attachment for your requirement. Many of these attachments are “off the shelf” but more commonly they are engineered and designed to your specific load. Allow us to help you with the selection or the design of a below hook attachment that will eliminate product damage and assure safe handling. 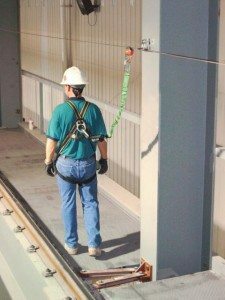 As the mechanical and structural design of overhead cranes and hoists has evolved so too has the type of electrical control systems. When purchasing a new piece of equipment today you will most likely select variable frequency drives for the control of the bridge and trolley motions due to their ability to control the acceleration and deceleration curve of the motions. In recent years, these drives have become the standard in the industry because of the many advantages they offer. Digital drives for DC cranes are also becoming very popular offering improved motor performance, torque control and reliability. Simple magnetic control systems are also still in use today offering an economical way of controlling the equipment. Older crane controls can create ongoing problems but there are solutions. Control modernizations of existing equipment has become a large portion of our business. Our Electrical Engineering Department and Sales Department can assist in selecting the proper replacements or upgrades to your equipment. No matter what your control preference is we can offer the right solution to your requirement. Remote control systems have improved substantially over the years. Whether radio or infrared, these systems benefit the operator ergonomically and increase safety. Consider a remote system for your next new crane or add a system to your existing crane or hoist. In addition to meeting all applicable global standards for Safety at Height, all components are designed for versatility, reliability and comfort. Ask us about our new equipment today. For a quote, contact Reading Crane using our web form or call 800-220-7203.